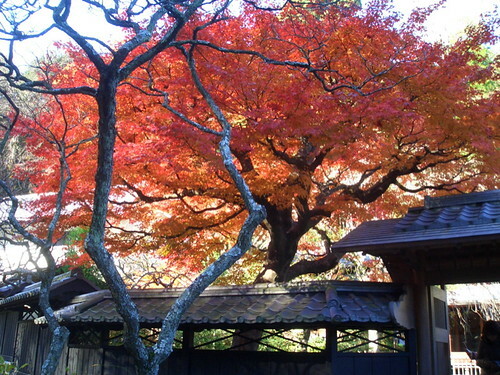 I went to Kamakura last Wednesday and it was pretty much the peak of the autumn colors. I can’t get used to how late autumn is in Tokyo. It’s mid December now and the reds, oranges and yellows are just now past the peak. Kamakura was the capital of Japan during the Kamakura Period (1185-1333) when the Shogunate wrested control away from the Emperor and the former capital in Kyoto. During this time, the warrior class distinguished itself from the Shinto/Imperial priestly class by practicing Buddhism. 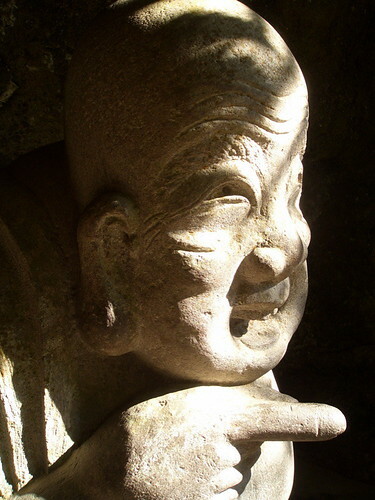 The austerity and fatalism of the warrior class developed a brand of Buddhism that favored austerity and fatalism, namely the various Zen sects. So the architecture of Kamakura reflects this, with all the temples and even the Shinto shrines designed and built very simply, without much decoration and almost no colors. Kamakura is probably my favorite place in Japan. Maybe even more than Kyoto or Nara. Nearly all the temples are within walking distance from each other. And the city itself is still charming, with no tall modern buildings, yet none of the ugly old run-down post-war buildings that’s usually the alternative in those other cities. It’s also only about an hour ride away by train from central Tokyo. And it’s never really been busy, so you can still get a nice spiritual experience, wandering around. I wanted to visit some of the out of the way temples that I’ve never been able to visit. They’re accessible only after an hour hike in the forests surrounding the city. But according to the guidebooks the best places for autumn colors are the large major temples I’d already visited several times. Since I’d never been there in the fall, and I haven’t been there in over two years, I figured it would be a new experience regardless. For the course that I followed click on this sentence. It’s a link to the Kamakura City site. They have over a dozen recommended walking courses depending on your mood or interests. I chose the one that started at Kita-Kamakura Station and ended in Kamakura Station, which hits the biggest of the Rinkai Zen temples. The whole trip lasted 4 hours even with a leisurely stroll, an amazake break, and a stop off for some udon. If you really want to make a day of it, I suggest you hop on the train and go further south another 2 stations and visit the Great Buddha, and the nearby Hasedera. Climb the endless stairs up the back of the huge temple grounds up to Hansobo. The view is excellent, but the trek up there can be taxing for those not in shape. I really dig the statues of protective what I call ‘crowboys’ that line the stairs. A shorter climb, but no less taxing, is the staircase up to Bonsho, which is the historically important large bell on a hill off to the side of the temple grounds. The bell is nice, but the important thing is to sit down at the teahouse up there and sip amazake or green tea while looking at Mt. Fuji peer around the wooded hills. 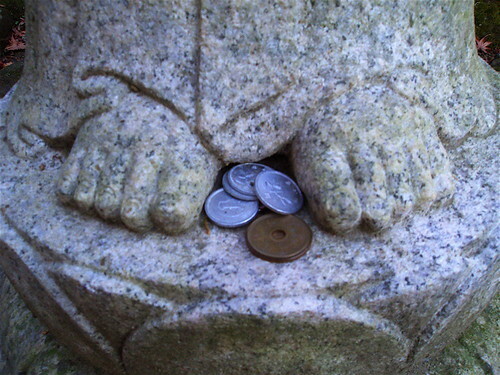 For more pictures from Kamakura, from all my visits there, click on this sentence. Great post. I would love to visit there someday. I love visiting the temples and shrines. I have yet to be south of Yokohama though. My favorite is Nikko. oh i highly recommend going there. i hope you do, since you seem to appreciate japanese history. it’s rich on so many levels. and there’s even a decent beach! Ah yes, Kamakura with tinted leaves. Simply beautiful, and especially on a weekday it’s nice and quiet. Meigetsu-in is one of my personal favorites. Beautiful in every season. Damn, would love to join you for another outing. You went there solo or with the misses? Greetz. i think the last time i was there was with you. was it two years ago? i think we were a bit too early or too late for the autumn colors. meigetsu-in was particularly lovely this time around. we’ll make another outing next time you visit, go to some of the more out of the way temples neither of us have been to. two years ago sounds about right. 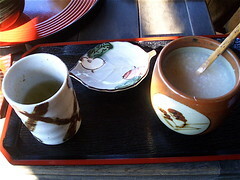 i remember drinking amazake with you at the place you mentioned in this wonderful post. it’s great to experience a bit of your world over here. you’re a beautiful friend. Next Next post: Gingkos on Platinum St.